You have a whole day to kayak down the Semois river or you may wish to spend a few hours discovering the beauty of the landscapes in the Ardennes. Or maybe you have turned up with your family and children or with your friends looking for an opportunity to engage in a sporting activity? We offer 4 different trips to allow you to discover the Semois valley at your own pace. 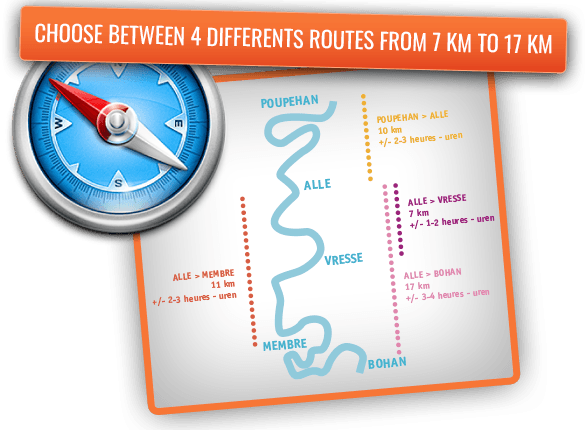 We have chosen the routes that best reflect your requirements in our endeavour to help you discover our Ardennes during your kayak trip on the Semois river. Your may prefer more of a sightseeing tour to help you discover the scenic spots in the valley or, alternatively, the wild and remote character of a nature reserve appeals to you. Our different trips were decided upon to please young and old alike, whatever their expectations. Ranging from 7 to 17 km, our trips will enable you to kayak down the Semois river at your own pace. Poupehan, Vresse, Membre or Bohan, the choice is up to you!